The Perth Mint of Australia has created a special 2012 Year of the Dragon Silver Coin for the World Money Fair held in Berlin. The coin has a limited mintage and features a water dragon reverse design. People born between the dates of January 13, 2012 and February 9, 2013 are said to be born in the Year of the Dragon. The dragon is the only mythological creature included within the Chinese zodiac. People born in dragon years are said to be confident, enterprising, independent, self-assured, brave and passionate. 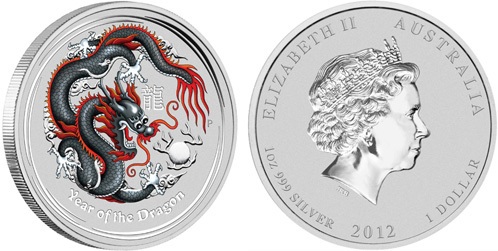 The 2012 Year of the Dragon Silver Coin released for the World Money Fair features a black dragon with red detailing. The color black is regarded as highly spiritual and has a significance and connection to the element of water. The reverse inscriptions include the Chinese character for dragon and “Year of the Dragon”. The obverse of the coin features the Ian Rank Broadley effigy of Queen Elizabeth II, along with the “2012” date, silver content, and legal tender face value. The Perth Mint has previously released an assortment of Year of the Dragon gold and silver coins, including bullion versions in a range of different weights and numismatic versions including proof, gilded, gemstone, and colored editions. Previously released colored editions featured a red dragon and were limited to a mintage of 10,000 pieces, which quickly sold out. The present release is limited to 5,000 and carries an order limit of one per customer. Each coin contains one ounce of 99.9% pure silver and comes in special coin show packaging with a numbered certificate of authenticity. For further information and ordering, please visit the Perth Mint’s product page. I got mine with absolutely no difficulty. I wonder whether Perth fixed the website problem or whether “dragon-mania” has started waning after so many products flooded the market last year. This is one of the most beautiful and unique coin designs I have seen from the Perth Mint – too bad they limited the purchase to only one per customer. The Perth Mint has had problems with their website in the past when demand was high for a product, a problem which they seem to have fixed. Encountered no problems when ordering the coin. This coin is certain to have a nice premium above the purchase price. I’ve been reading several posts about the Perth Mint’s dragon coins, so I looked up their website to see what’s going on. The black dragon is still listed for sale on their website. They also have a new dragon series, called Dragons of Legend. At one ounce with 5,000 mintage, the first coin is the Red Welsh Dragon, colorized in — what else – red. Forthcoming releases will include the Chinese Dragon, St. George Dragon, Bulgarian Three-Headed Dragon, and European Green Dragon, all of which I assume will also be colorized. The Red Welsh Dragon coin is very attractive but very pricy at over US$110, and is minted for the tiny nation of Tuvalu. My question is: Although the coin is an expensive and obviously contrived product from a relatively small country, will the attractive design, low mintage, and being part of an ongoing series help the coin (and set) maintain and hopefully increase its value? I’m even more green when it comes to foreign coins than you are, Two Cents. I picked up the dragons mostly because I liked the designs. I have no intention of selling them but it seems likely they will be valuable in the future. But as for other Perth series like this, I don’t know. A lot of these limited mintage foreign coins don’t catch on, I think, and don’t go for much on secondary markets. I have no idea how to really judge values for some of these. I’d just go for what you like with them, and if they take off, great, and if not you still have a nice coin you like. Looks like a sellout, status literally just flipped to unavailable. I picked up 6 at The Perth Mint stand at The WMF. They were flying off the shelves. There were no limits, except one man asked for 20 and was limited to 10. When I went back to the stand the young lady told me they would hold a few back for Saturday, but it was going to be a sell out. By about 11.30/12 noon they were up to number 1500 / 5000. Lots will have been sold on the website to. At 70 euros I think they are a fair price. It will be interesting to see what they resell at. Black Dragon coin is sold out on Talisman now too, I think one’s going to be another winner. I’m a little surprised the coin & cover hasn’t sold out too, I guess people are gunshy of clad even when there’s a dragon on it! The Tuvalu Red Welsh dragon coin Perth put up for sale seems to have vanished even faster than the 2012 black. There still seems to some available from Talisman however. Im suprised Talisman only priced the Black Dragon at $99. I suspect we will see the price rocket on eBay now. £150 do you think? I would guess it will probably be £150 and $250 on average, with some luckier sellers getting as much as $400 and £250. I think the red welsh will also go for similar premiums. My guess is premiums will be similar to whatever the regular 1 oz proof varieties are currently going for. Thanks CaptainOverkill – I always look forward to your insight. I had bought a Black Dragon early on for my brother, who was born in the Year of the Dragon, for his birthday. Guess I lucked out — thanks Michael for posting this blog. The Red Welsh Dragon is sold out too, or at least is Unavailable on the website. Looks like the Perth Mint sells out of its products quickly. If you want it, you have to act fast. I notice that some products are labeled SOLD OUT and others are UNAVAILABLE. What is the difference? Does Unavailable mean that the maximum mintage has been reached, and the Perth Mint is checking the per-order limit and confirming the charge with the credit card companies? Or does the Perth Mint allow private companies to also sell their coins, and they need to check with these outside companies to see if their allotment is sold out? Or something else? Does UNAVAILABLE always turn into SOLD OUT, or have there been instances where the coin does become available again, even if only for a short time? I’m brand-spankin’ new at this collectible non-circulating foreign coin field, and would like to learn how things operate before I start buying into it. I guess what I’m asking is – how have other similar coins done in the past? Have their values gone up … or down? And why do you think that happened? One thing that makes me chuckle are some of the limited-edition coins that the world mints sell nowadays. I particularly laugh at the colorized Star Wars coins with Darth Vader, Luke Skywalker, the droids, etc. and the coins shaped like guitars. It would seem that these legal-tender “coins” would not be collectible in the near or far future, but who knows? Technically the WMF Lunar Dragon hasn’t sold out if they held back some for the second day (today). I guess this is why its ‘Unavailable’ from the Perth Mint shop. Prices on this one wont go down. Though I’m suprised that it is reselling on ebay with one dealer for only £87.20. Another dealer is going for £129.48. Im going to watch and see what luck they have selling theirs. The WMF black dragon is the same coin that is in nine coin set (mintage 20000) distributed in China just different packaging. Is that correct? Does anyone know why they say the mintage is only 5000? Can someone please clarify this for me? the 9-dragon set doesnt have a black one. the 9-dragon set does not have a black one. so the “grey” dragon in the 9 coin set distributed in china is not the same black dragon released in the berlin money fair show. pictures online everywhere shows they are the same color except the one in the 9 coin set is called grey/red and berlin coin is called black/red. does someone have a real picture to compare? I don’t have a picture but i have the nine coin set and it looks like the same exact coin. Almost 100% positive it is same coin with different packaging. That would bump the mintage to 25000. If it is then why would the PM do this? Visit ebay and talisman for photos. Cody, I too own a complete Baoquan set (the set the Perth Mint made for Baoquan Coins Investment Co Ltd in China). The NGC designated 2012-P Australia Grey-Red Colorized 1 Oz Silver Lunar Dragon looks to me to be identical to the “Black-Dragon” issued for the Berlin WMF. The Perth Mint also released a 4 coin dragon typeset collection (Item code 2S1226DZAA) with a “specimen quality coloured coin” that looked to be identical to the NGC described Orange-Yellow coin in the Baoquan Set. I have not been able to compare these coins side by side; however the photographs look the same. Different packaging same coin; I suspect this is the case and if the coins cannot be distinguished when they are removed from their packaging, I find that highly problematic. The Black-Dragon is described as a “Reverse Proof” the Baoquan set is composed of colorized bullion coins (grade MS) so there should be a visible difference but somebody just has to have both coins in hand to make that determination. It is just too hard to tell from photos. The Perth Mint has gone a bit overboard with these Dragon coins, way too many variations to keep straight and still more to come. Thanks Ultra-crepidarian. When I saw the nine coin set I had to have one. I think this set looks much better than the 1oz. colored (10,000 mintage). With the release of the WMF black dragon I wonder if it will increase the value of the Baoquan set. Any thoughts? Just to report back. I just received both the 9 coin set and the Berlin coin. The grey and black dragon look VERY similar. After close examination, I can tell that the grey dragon from the 9 coin is just a tad lighter in color than the black dragon. The black dragon doesn’t really look black in person, just a TADDDD darker color than the grey dragon. It is very lightly if the coins were taken out of packaging but left in the airtie holder, you won’t be able to tell them apart by a glance. The grey dragon and the black dragon also seem to have the same “reverse” proof finish as well.